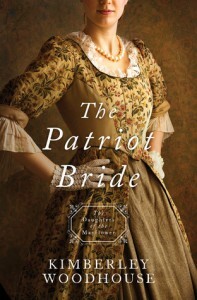 The Daughters of the Mayflower series continues with “The Patriot Bride” by Kimberley Woodhouse. This unique series is generational, with each installment highlighting a woman descending from Mayflower voyager Mary Elizabeth Chapman, who was the focus of the first book. In “The Patriot Bride” we meet Faith Lytton Jackson, a 32-year-old woman residing in Boston as the colonies head toward war with England. With things intensifying, Faith and a named Matthew Weber become spies for the patriot cause, facing the dangers both of being caught and of their budding relationship. This story contains many gems that make it stand out in the historical fiction genre. Faith makes a daring heroine, one who challenges the status quo of eighteenth century female conduct with her sharp intelligence, independence, and valor. The faith element is strong, and there are many scripture verses throughout the text, underscoring how much the fight for and eventual victory of the American Revolution depended upon the patriots’ faith in God. Along with the fictional characters are some easily recognizable historical figures, including George Washington and Benjamin Franklin. Including them not only strengthens the setting but also gives readers a glimpse into what they may have been like in their personal lives and interactions. It is all too easy to view the Revolutionary War from the safety of history, knowing the outcome and forgetting how radical it actually was. “The Patriot Bride” drives home the reminder of how steeply the odds were in Britain’s favor and of the awful—and often gruesome—consequences that awaited the patriot leaders if they lost and demonstrates how these early American overcame the odds to form our nation.